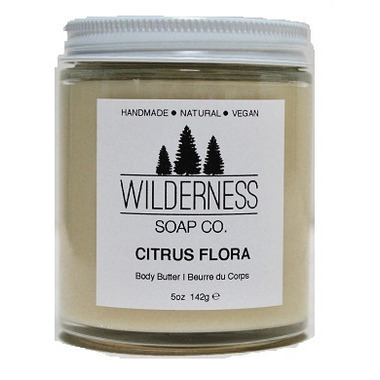 Wilderness Soap Co. Citrus Flora Body Butter is a fresh and invigorating body butter blended with citrus notes, delicate florals and earthy patchouli. It's blended with rich Shea Butter and Vitamin E for long-lasting moisture. Ingredients: Butyrospermum Parkii (Shea) Butter, Cocos Nucifera (Coconut) Oil, Prunus Amygdalus Dulcis (Sweet Almond) Oil, Arrowroot, Macadamia Ternifolia (Macadamia Nut) Seed Oil, Tocopherol (Vitamin E), Pogostemon Cablin (Patchouli) Oil, Canaga Odorata (Ylang Ylang) Flower Oil, Citrus Grandis (Grapefruit) Peel Oil, Citrus Sinensis (Orange) Peel Oil. Contains Nuts.